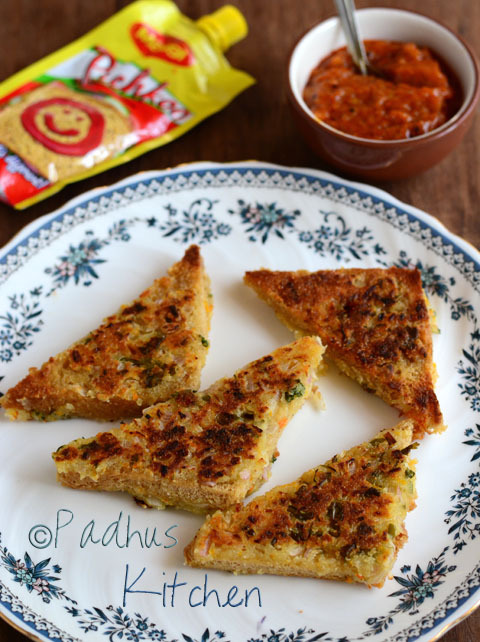 Bread Rava Toast can be had as a breakfast or as a tea time snack. This is a very simple dish prepared by spreading a batter made with rava, yogurt and vegetables on bread slices, which is then fried until golden brown. If you are bored of eating sandwich toast with jam or butter, then try making this bread rava toast for a change. I have added grated carrot and chopped capsicum to the batter to make it a little healthy. Today we will learn how to make bread rava sandwich following this easy recipe. Chop onion, green chilli, coriander leaves and capsicum finely. In a wide shallow bowl, mix together rava, curd, ginger-garlic paste, onion, green chilli, coriander leaves, capsicum, grated carrot and salt needed. Let it sit for 5 minutes. The batter should be thick but not too thick. It should be of spreadable consistency. Cut the corners of the bread and then cut it diagonally. Spoon the batter thinly and evenly on both sides of the bread. Heat a tawa and place the breads on it. Drizzle a tsp of oil (or oil + ghee mix) around the bread and toast on low heat until deep golden brown on both sides. It will take time, so you can carry out your other cooking activities side by side while the bread is frying. Repeat the same process for the rest of the bread. Serve hot from the tawa with mango thokku or sauce. It taste good on its own also. Prepare it for breakfast or enjoy it with tea! Very innovative and simple recipe..sure gonna try this weekend!!! I never expected such doubts - Keep the bread on your hand and spoon the batter on the top side of the bread, place it on the tawa with the batter side down, then spread batter on the other side with a spoon. that's it! Very innovative. When you say rava/ sooji, do u always mean the white rava? Can v use the samba rava, the brown rava which is the healthier version? Do not use samba rava as it will take long time to get cooked. It was so yummy and different from the regular French toast. Thanks Padhu for sharing it. :). Instead of spreading the batter, can u dip bread in batter and do deep fry in oil like we do for Bajjis? Yes, you can dip. But as it will not stick to it properly, I have spooned the batter. I had a packet of bread with expiry date tomorrow.. not knowing how to finish it that too as a tasty dish.. padhu flashed in my mind & tried this rava toast.. as usual I rocked. Added this to my cookbook! Thank u Padhu. Tried the recipe this morning. Everyone loved it.... thank you. Lovely recipe.. can I toast this using toaster? It is better to use tawa as it will be a bit messy with all the curd, rava etc. wow..so simple and easy recipe.i made it as evening snack and my hubby loved it so much that he frequently ask me to make it..thanks padhu.keep posting..i think this is a simple recipe with rava specially for evenings. Padhu can I use milk instead of curd ?? ?